For storage or delivery using a SmartMetals account. Account application and funding required. *Current market price. Actual price determined at time of purchase. Refer to the table below for prices at other locations and volume levels. 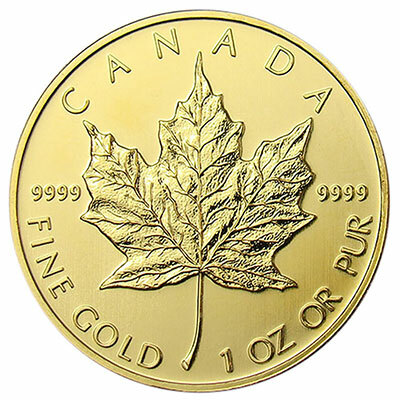 The Gold Canadian Maple Leaf is one of the most popular gold coins across the world. It is a stunning gold coin that is both highly regarded and sought after. In production since 1979, the Canadian Gold Maple Leaf is a 24-karat gold coin, meaning that it contains 99.99% pure gold. The Maple Leaf coin is available in several different sizes, however, it is the 1 oz version that is the preferred size among investors. This coin contains one troy ounce of fine gold bullion. An excellent investment, the front of the coin features a profile of Queen Elizabeth II. The reverse displays the iconic maple leaf. The Canadian Maple Leaf is backed by the Canadian government. It has legal tender status, with a face value of $50 Canadian. Investors can include the Maple Leaf in a precious metals IRA. Due to its worldwide popularity, the Canadian Maple Leaf is a brilliant choice from an investment perspective. 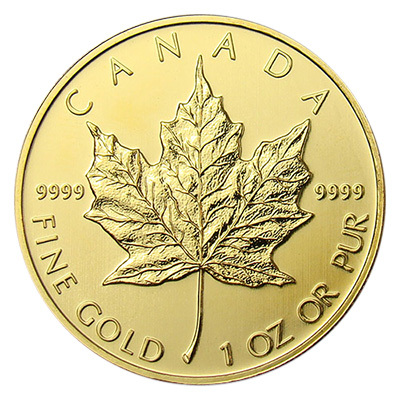 Add a 1 oz Canadian Maple Leaf gold coin to your portfolio today. The Hard Assets Alliance offers only bullion from the world's top wholesalers and dealers. No numismatics or rare coins - only widely recognized sovereign coins and standard bullion bars. Why? Because they hold their value more consistently than any other form of precious metal. Accepted at monetary exchanges, coin dealers, and banks around the world, the bullion we offer is among the most liquid forms of precious metal on earth.